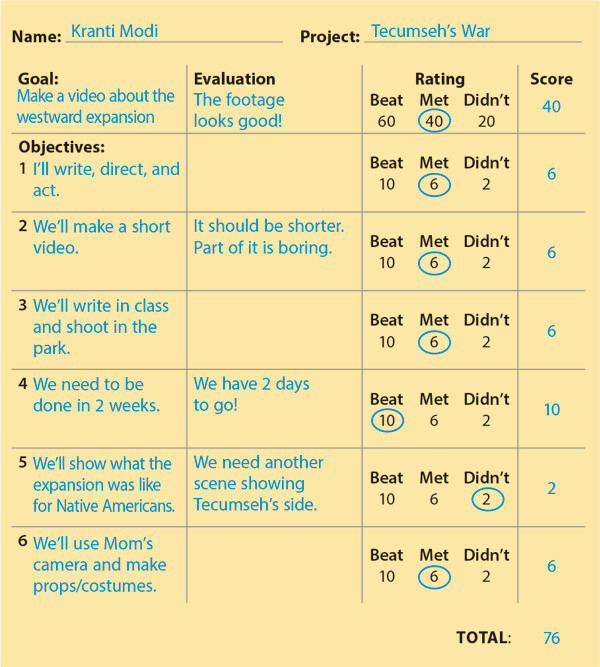 A student created this rubric for a video project on the U.S. Westward Expansion. Note how the student copied his goal and objectives from the planning sheet that he had created (and his teacher had approved) at the beginning of the project. Even if you haven't filled out a planning sheet for a project, you can quickly build a simple rubric to evaluate it. Go step by step through the first "Your Turn" activity below. Your Turn Create a rubric to evaluate a project. Download the blank rubric template at the bottom of this minilesson. If you have created a planning sheet for this project, copy the Goal and Objectives into the first column, and your rubric is ready! Who is supposed to work on this project? Where should the project be done? When should the project be ready? How should the project be completed? Your Turn Evaluate a project using your rubric. Goal and Objectives: Complete the first column as indicated in the previous "Your Turn." Evaluation: In the second column, describe how well the project met the goal and objectives. Rating: In the third column, circle a number to indicate whether the project Beat, Met, or Didn't meet the goal and each objective. Creating a Rubric to Evaluate Projects by Thoughtful Learning is licensed under a Creative Commons Attribution-NonCommercial-ShareAlike 4.0 International License. Based on a work at k12.thoughtfullearning.com/minilesson/creating-rubric-evaluate-projects.